In India, tea is generally served with sweet and savory snacks. Laadus are the ‘roly poly’ traditional sweet snacks. In Maharashtra, they are enjoyed with the afternoon tea, along with a savory snack like chivda. Laadus are also served on festive occasions and are great as travel snacks. There are many varieties of laadus, some healthier than others. The same is true for the snack bars we get, right? So I thought why not combine the healthy goodness of the two? I am happy to report that the experiment worked and the laadus are nutritious and so yummy, that they are addictive. 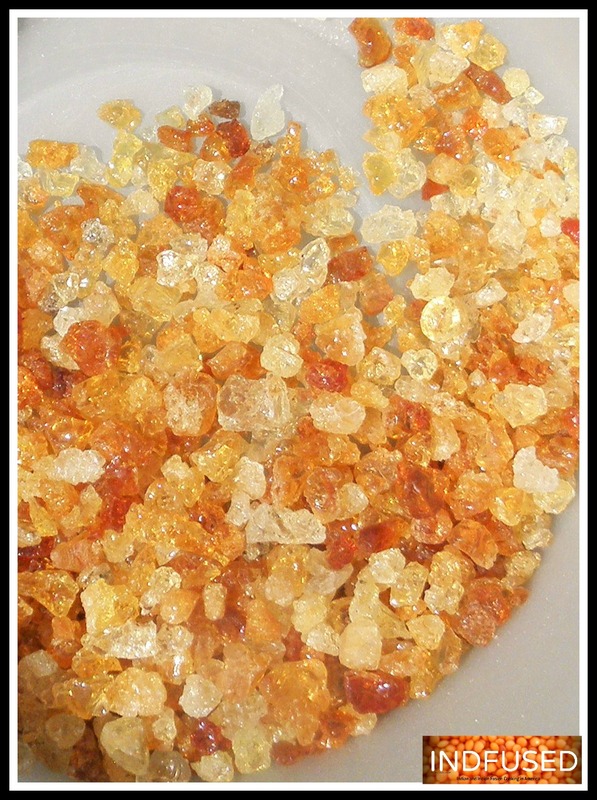 ‘ Dinkacha Laadu’ as it is called in Marathi, is a laadu made with edible gum Arabic, that is known for its health benefits. 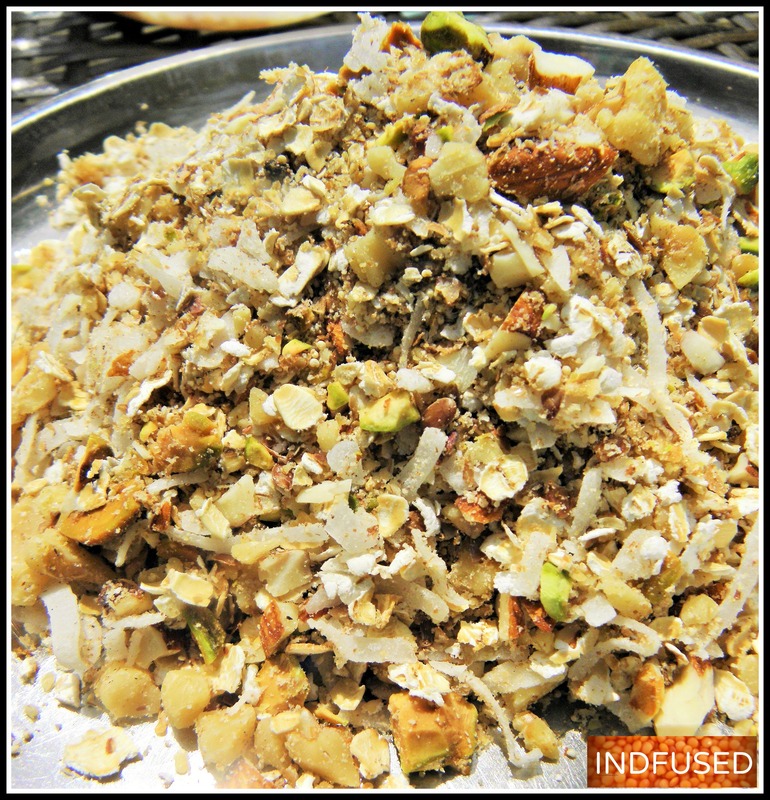 It is also packed with almonds, poppy seeds and dried shredded coconut. The laadu is generally bound with a sugar syrup. 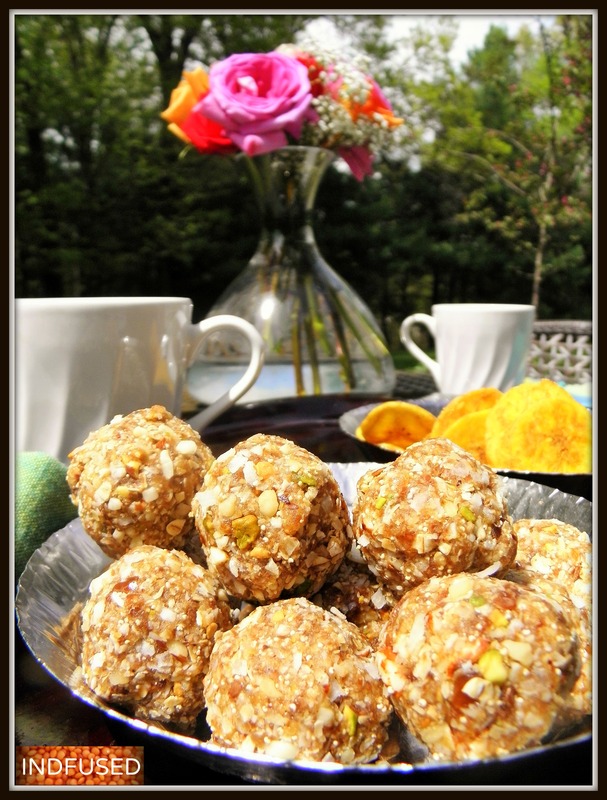 I used dates for their natural sweetness and as the binder in this recipe. I also added oats, walnuts, pistachios, flax seeds….yes snuck in as much of the healthy stuff as I could……. My children have a lot of funny stories to tell about me sneaking in nutrition when they would have been perfectly happy with ‘junk’ food:)…a story for another time! Warm the ghee in a pan and add the powdered dinka. Stir, remove pan from heat. When cool enough to handle, rub the ghee into the powder and set aside. Dry roast the oats and the poppy seeds in a pan, over low heat until toasted and fragrant, about 8 minutes. Add to the powdered dinka in ghee. Add the ground flax seeds, coconut, nuts, cardamom powder and the sea salt. Mix all together. In a food processor, process the dates until they are finely chopped and start clumping together. Add in the combined ‘laadu mixture’ of oats and nuts etc. (in step 2) and pulse a few times until the mixture comes together in a ball. These laadus are adorable little pick me ups, giving a boost of nutrition and energy. The kids will find these granola laadus appealing too:) and you can enjoy your with an afternoon tea with friends! I am taking my roly poly laadus to the fiesta at Angies hosted by Justine and Jhuls! See you there! I love Laadu, I also really love this healthier version. I can imagine how delicious with a cup of tea. This looks awesome, just wondering is there a particular place you recommend on where to get the Arabic gum? I have seen it in Indian stores but I am also going to check Whole Foods. I recently found out that it is regularly used in making soft drinks. I just see that is available on Amazon. That is awesome Sandhya..so glad u posted the recipe! What a great title :). I love snacks that are healthy and delicious. Thanks for sharing…these look amazing! Yay, I’ve been looking for a good recipe, since I have dink at home 😀 😀 This is happening soon!! I love love love these laadus!! Thank you Sandhya! Thanks Naina ! Let me know how you like them! Mm …. very tasty ! I can relate so well to the pants not fitting…I am in that same boat, Jhuls! Thank you Loretta. My family loves laadus and were happy with this healthy version. Yes I took the picture in my back yard…my neighbor and I love to get together for tea and a chat. Thank you so much for your feedback Samita! This looks so delicious! I am not sure if I can get dinka here, but I will check in Turkish shops, hopefully they have it so I can make this myself. Thanks for the recipe! Indah, Dinka is available on amazon too. Thank you for the recipe, I made the laadus yesterday and they taste delicious. The recipe is very easy to follow. Happy Diwali. Thank you so much Tejal for letting me know. I am so glad you liked the ladus! Happy Diwali to you too!